"Nomadic space-folk" Astralingua are chillingly pensive on "Space Blues" from their upcoming LP, Safe Passage, which they discuss in this interview. 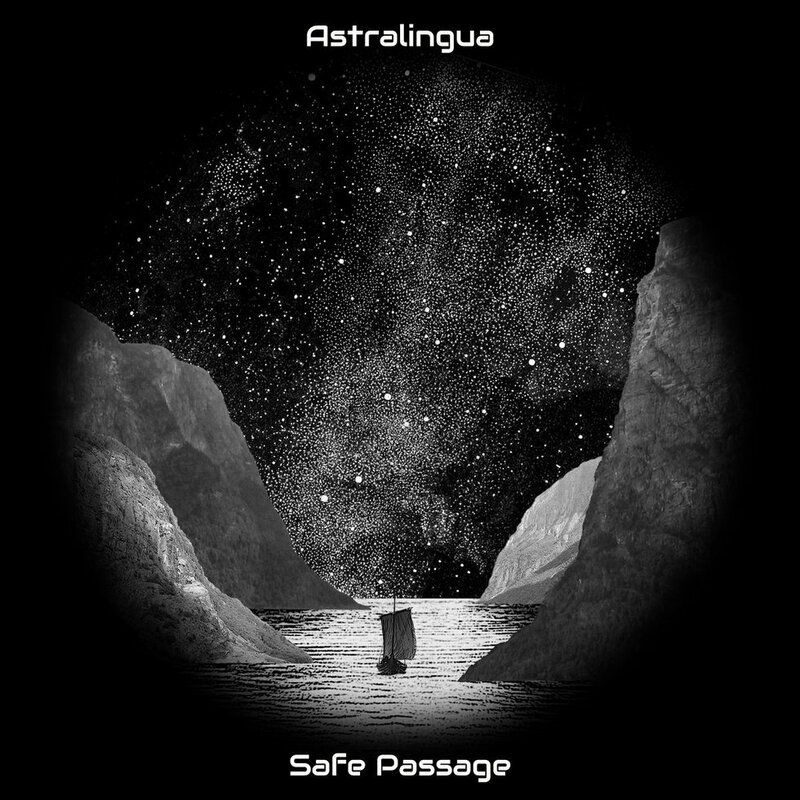 The term "Astralingua" refers to the language of stars and astral planes, and on their latest record, Safe Passage, the "Nomadic space-folk" pair creates invasively introspective and elegant music to exemplify their namesake. Comprised of composer/vocalist Joseph Andrew Thompson and back-up vocalist Anne Rose Thompson, Astralingua ensures that each of the LP's 11 tracks lingers with awe-inspiring sounds and arresting soul, ranking alongside meditative masters like Nosound, the Autumn Chorus, Midlake, Sufjan Stevens, Ulver, Lady and Bird, and Agalloch in the process. While it's among the most unassuming tracks on the album, their newest single, "Space Blues", is easily one of the sequence's most evocative and gorgeous trips. Indeed, "Space Blues" is among the best representations here of how Astralingua employ "haunting vocal harmonies, radiant string ensembles, and otherworldly soundscapes" to craft richly poignant classical folk journeys. Using the dissonant soundscape of the previous track, "The Nimble Men", as a launching point, morose strings and acoustic guitar arpeggios set a tastefully foreboding stage on which the couple's harmonies blend exquisitely. This aural tapestry, combined with sentiments like "Empty and cold / I miss my home / But I am so long gone", truly capture the sense of being spiritually and physical adrift in an endless vacuum. As it progresses, additional timbres (namely, woodwinds), add to its bleak beauty, cementing the fact that the most powerful music is often modest yet mesmerizing. Get lost in Astralingua's "Space Blues" below and then read on to learn more about the writing and recording developments that made the record so profound. Of course, you're also encouraged to take the full voyage when Safe Passage releases on March 8th via Midnight Lamp Records. You can preorder it here. Elsewhere, you've discussed how William Blake influenced another track on Safe Passage, "A Poison Tree". Did anyone in particular inspire "Space Blues"? Joseph: Maybe Pink Floyd in terms of their cosmic psychedelia, but I don't know that I had that in mind when I wrote it. I wrote it when we were out in the Mojave Desert, in this cabin in the middle of nowhere. The view of the stars was incredible, so that kind of inspired it as I sat out there and played around with it. Cool. I wonder if you're familiar with bands like Nosound, Gazpacho, the Autumn Chorus, Agalloch, Lady and Bird, and/or Anathema. I think your music fits in with theirs since it's lavishly contemplative and melancholic. I'm not at all saying that you borrow from any of them, of course; there's just a connection between you and those artists in terms of poignant atmospheres and the like. Anne: No, I can't say we listen to any of those [laughs]. I've come across Anathema a few times when looking at reviews and things that are similar to our style. Oh, okay. Moving on, what was the process for recording the album? Joseph: Some of the tracks were demos, and we wanted to capture it as we were writing it to keep it as pure as possible. We traveled with a mobile recording rig and we set that up in the desert. As we were sketching the songs, we'd keep a take if we didn't think we'd get a better performance, and we basically just did that while on the road and in cabins all over the country. Anne: I think that once we decided to add the strings—that was when it began to grow and we knew that it'd take a couple years instead of being something quick. It was worth it. The whole LP deals with topics like remoteness, mortality, and movement between worlds. A lot of existential pondering, I guess. Can you give any more insight into what you're trying to say with "Space Blues"? Joseph: It's about the wonder and isolation that growing consciousness creates in a person. You might even say that it's kind of about being between galaxies, about that feeling you'd have if you were in-between galaxies and facing the emptiness and detachment from everything familiar to you. You're looking out into space and it mirrors what's going on within you. That actually reminds me of something Dr. Stanley Ambrose paraphrases as a voiceover on an Anathema song, "Presence". He says, "Life is not the opposite of death. Death is the opposite of birth. Life is eternal." Joseph: That's exactly it. It wasn't intentional; we just started writing the music and then we had to decide what to call the record. I told Anne, you know, that we'll keep working on it and at some point, it'll be clear. Eight or nine songs into it, I looked at it and thought, Okay, this is Safe Passage. That's what this whole thing is about. It really fits the vibe of it as a singular work. Anne: Yeah, definitely. Thank you. How does the cover represent those ideas, then? Joseph: It's a boat traveling through a fjord to the great expanse in the sky. That horizon is maybe where we go when we leave this existence. The ship is life; it's you. You're the vessel traveling through it and hopefully you get out to that open space unscathed. Anne: You try to make the stars as enchanting and breathtaking as you can in a black and white illustration. We wanted to show the magnificence of it. I think it does, and as odd as it may sound, I think the music is black and white and gray, too. I don't think a colored cover would fit, if that makes sense. Anne, you're credited as the back-up vocalist, and you're an essential part of it, of course. Outside of that, though, how much involvement did you have in the writing and arranging of Safe Passage? Anne: My role is to let Joseph do that without interfering too much, and then I can be his soundboard afterward. He does it all on his own and then if he has a question about a line or a part, I'll be there to give my opinion. It's the same with the harmonies; they're usually something he'll come to me to try out with my voice. Joseph: When I'm writing in that creative mindset, I'll get lost in it for hours and forget to eat. Anne definitely fills that role of making sure I have food and coffee to keep my on track while I'm floating off on cloud nine. It's a good partnership in multiple ways. I wouldn't say that the album is depressing, but again, it's evocative. It makes you think about life. I, for one, find that kind of music very uplifting even though I wouldn't say I'm a sad person. A lot of artists do, too, such as Steven Wilson. He's said that people think he's a sad hermit because he makes sad music, but that's not true. Where do you two stand on that? Joseph: Yeah, I definitely relate to it more. I like happy music and pop music, like The Beatles, and Bob Marley, too, but I connect most with melancholic music. To me, it shows a connection to reality. It's a tough world and a tough life, you know? There are ups and downs and there's beauty and ugliness, so you can't go through all of it with the same level of chipper happiness. Anne: [To Joseph] Even the pop music you like is usually based on substance and realism. Artists like Death Cab for Cutie and Tori Amos and Bat for Lashes do it really well. Joseph: It helps to know that other people are having similar experiences to you. You aren't alone; everyone goes through those things. It's helpful. Anne: You can feel glad about dealing with it through music instead of not dealing with it at all. If you write an album that connects to somebody so precisely and speaks to them, it's wonderful. They may really need it. Absolutely. It's cathartic. Going back to the record, are there any favorite songs if you had to pick? I know it's like choosing between your babies. Joseph: It is. Well, I really enjoyed writing "The Fallen", particularly the cello solo in the middle. It's a great piece that I was really delighted with. I said to Anne, "I don't think I can write a finer little passage of music than that" [laughs]. Also, "Visitor" because of the haunting image it gives me. Anne: I really lose myself whenever we do "The Troubled Road". It's so simple but I always fall into it. Those are great choices! I'm a big fan of interlocking vocals and vocal rows, etc., so the ending of "Sweet Dreams" is my top moment. Joseph: That's cool. That was fun to do, too. It was spur-of-the-moment improv. I knew that we wanted to do a round of some kind, and I wanted to keep adding to it so it would go on forever. Those passages tend to be sort of hyperactive and in-your-face, at least in terms of progressive rock, but you add space between the lines. That makes it even more ethereal. Is it difficult to bring this music to life in a live setting? Joseph: We're trying to put together a tour in the northeast. To me, performance is about going into that space and sharing it. Think of a band like Low. It should be as simple as we can make it. Just an acoustic guitar and voices. If we can't grab you with just those parts, we're doing something wrong. That should be enough to quiet a room down, right? Joseph: Really, that's it. If we can get to that point where we're lost in ourselves and bring the room with us, it's perfect. I've had a few debates with people about whether or not there's a difference between a "song" and a "track", and I think that's just it. The song is that core once you remove the embellishments. If that doesn't hold up, the rest almost doesn't matter most of the time, so it can be a great track but a mediocre song. Joseph: That comes into the writing process. I want to write material that can be played that way. Anne: We only record once the whole song structure is there. We'll sometimes use parts of what we've tracked as demos but we won't say that it's ready until the structure is in place. That makes complete sense. Any final words on "Space Blues" or Safe Passage in general? That puts you both on the spot, I know. Sorry. Anne: It really does [laughs]. We hope that the song has such an expansive message that it can be interpreted many ways and reaches people on different levels. Joseph: I hope people give the lyrics a chance as well; I wrote it in such a way that it could be taken different ways. There are a few literary references and other things to pick up on if you really pay attention. That's true for "Space Blues" and the whole LP. I could say everything about it but I think you have to leave it open for people to figure out and decide if they like it or not. The beauty of a project like this is that it plays into your own reading. What do you want it to represent? Does the artist even have a right to say if there's a definitive, overarching point? Poetry is like that. Joseph: Blake was adamant about not explaining his work for fear of ruining it. He preferred letting his audience see it as they would. Anne: He had his own mythology, but you don't need to be schooled in him to appreciate and understand what he did.